This would seem more playable if it was "random enemy minion." The vast majority of the time one is hoping that, if the Demolisher survives, it takes out or softens a minion for a trade. Though a bigger buff would be keeping "random enemy" and having it launch at end of turn. this card is so underrated, i can almost use it in any class deck. my opponent having a hard time if i play this early, almost his/her played minions would be 2 health less, which means you can continuously get advantage trade. 4 health for 3 cost, 2 damage each turn without having to take return damage. This plus Master of Disguise means a nearly untouchable card? When you use stealth, if the stealthed minion deals damage in any form it loses stealth. These rules apply to anything such as Knife Juggler or even Ragnaros. But... That means the card has done its job. Master of Disguise ends when the Demolisher's effect is important. He was probably referring to the old Master of Disguise, where the stealth effect was permanent until they deal damage. Oh yeah, I forgot about the nerf. Actually, this got changed recently. Now Stealthed minions lose Stealth only if they attack. Why arent people running this? It seems awesome! A 3 drop that basically has to be dealt with, how many other 3 drops can say that other than Eydis Darkbane? You don't see many Knife Jugglers in mech decks as there are so many powerful 2 mana mechs. Knife Juggler is the prime 2 drop in the game, but I still would't put him in my mech deck as I rather don't want too many 2 drops and I rather have Mech Warper, Micro Machine, Annoyatron etc. to maximize mech synergy. 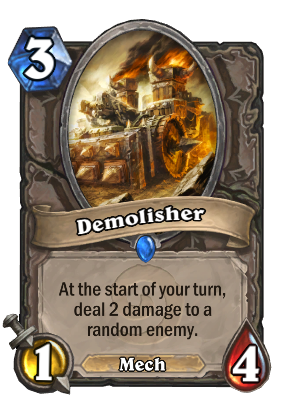 3 mana slot often go to Spider Tank and Tinkertown Technichian, so MAYBE you can fit this in as a 5th 3 drop? For any non-mech deck Knife Juggler is the better pick as he has a good ability AND stats, Demolisher unfortunatly only has the ability, but probably too poor stats to back them up with. There arent too many good 3 mana minions, so I think this card should definetly see some play. You can, if your lucky, take out a 3/2 or a Shade of Naxxramas for free with the ability and still poke away a token with the 1 Attack stat. Too slow card to be worth anything. I'm glad other people like this card. I rarely see it played but I gave it a try just for the hell of it and while it's not OP it seems like a pretty solid card for some decks. Love this card. My opponents always do whatever it takes just to get it off the field, and I come away with a card advantage. Even better if the opponent wastes a silence on him. This guy is a monster if he sticks. Best in priests with decent taunts and healing. Or in shaman with taunts. Or paladins with shields. Also fun with a mage. It can pay the damage you need on your opponent's creature so your other burn spells/power can finish it off. Good card but not so OP, can be dealt with by a lot of spells and minions with silence. This card is the Murloc deck demolisher.